An adorable addition to your day, the Bohemia Market Pom Pom Basket in Orange, Fuchsia, & Yellow is an eye-catching accessory that is sure to be the envy of everyone around you. 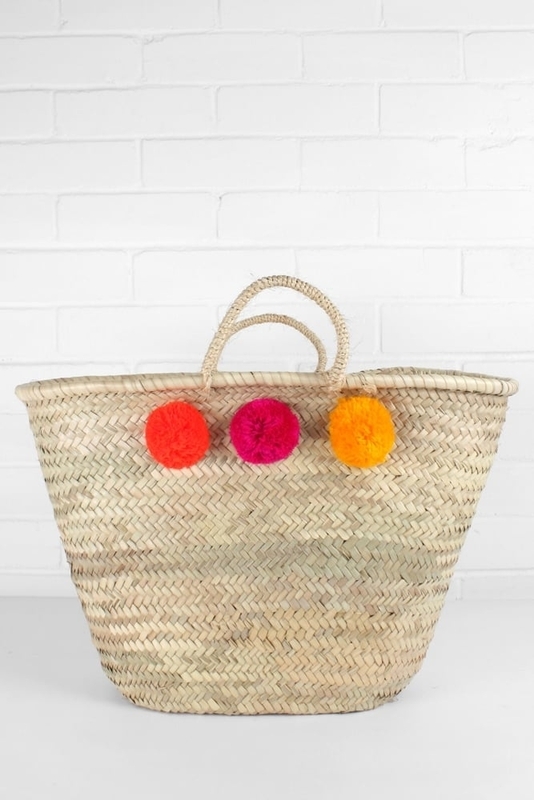 Ethically woven by artisans in Morocco, this beautiful basket is handmade from strong palm leaf, with comfortable sisal cord handles, and is finished with brightly coloured pom poms handmade in India. Comfortable to use, the Bohemia Market Pom Pom Basket in Orange, Fuchsia, & Yellow is the ideal size for taking to the weekend grocery shop. Bright and summery, this handmade woven basket will brighten up the dullest of days.